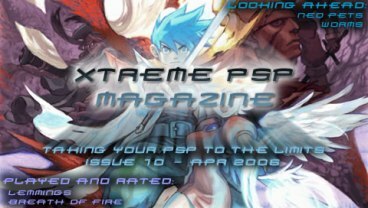 Issue 10 of the Xtreme PSP Magazine is now available for download. Issue 10 is packed with over 100 pages of great content including Previews of Worms: Opem Warfare and MLB 2006, reviews of Lemmings and Breath of Fire III. And all the regular content including tutorials, tips and cheats, the latest news, PSP rumors and more… Download it now!